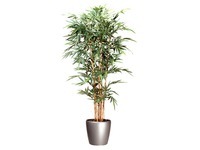 Black bamboo 12 sticks + pot. Artificial plant for inside. Stump in wood, leaves in fabric. Plastic pot. Dim. : H 180 cm. Squared pot.